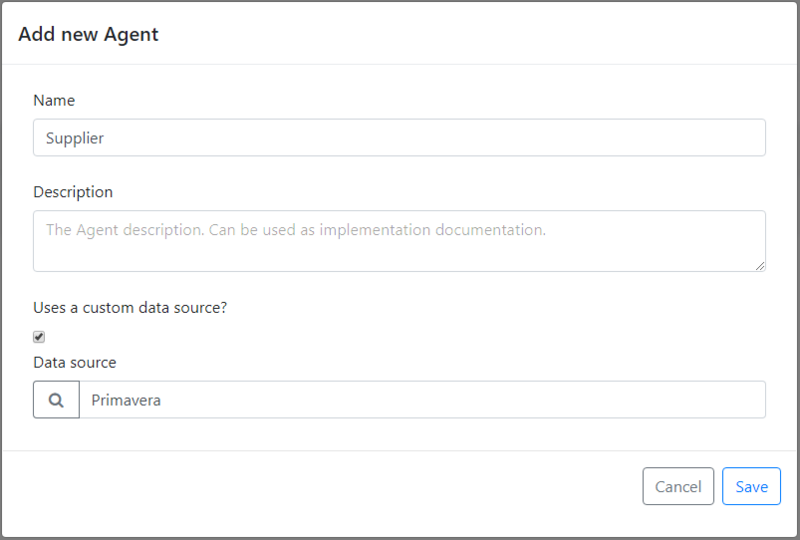 Based on a Purchase Orders management scenario, this tutorial shows a real scenario of how easily OMNIA can combine information from multiple external data sources, using the OMNIA connector to access data located on-premises. The tutorial is divided in 4 different areas. On the first area, Create a new connector, we are going to check how a new connector is created and associated to a tenant. Next, on Modeling entities area, we are going to evaluate how to model the core entities for this solution from scratch. On the third area, we are going to focus on Purchase Order modeling, combining all previously modeled entities and integrating information on ERP Primavera. To end, we will evaluate how to communicate with an external API. As our custom data source, we are going to use the PRIMAVERA ERP V9. The chosen external API is Last FM, which provides data related to music. On connectors list, select the previously created connector, and a modal with its data should be shown. Through the left side menu, create a new Agent by accessing the option Agents / Add new on the top right side. Set “Company” as its with name. Through the left side menu, create a new Generic Entity by accessing the option Generic Entities / Add new. Set “Artist” as its with name. Create a new Agent with name “Supplier”, and set it as using the external data source “Primavera” that you created earlier. Create a new Data Behaviour for the operation “Create”, so that a new Supplier is created on Primavera ERP when it is created on OMNIA. Go to modeling area. Create a new Resource with name “Product”, and set it as using the external data source “Primavera” that you created earlier. Go to modeling area and, through the left side menu, create a new Commitment by accessing the option Commitments / Add new. Set its Name as “GoodsPurchaseRequest”, “Product” as the resource to be exchanged, “Supplier” as provider agent and “Company” as receiver agent. Before saving, check option “Uses a custom data source?”, and select “Primavera” as Data Source. Through the left side menu, create a new Document by accessing the option Documents / Add new. Set its Name as “PurchaseOrder”. Before saving, check option “Uses a custom data source?”, and select “Primavera” as Data Source. Navigate to tab “Data Behaviours“, and define a behaviour to be executed on “Create”. This behaviour will be used to create new instances on ERP everytime a new PurchaseOrder is created on Omnia. Go to the Application area, and validate that ERP Purchase Orders can now be listed. On Modeling area, navigate to “PurchaseOrder” tab “Entity Behaviours“, and define a behaviour to be executed “After Change”. This behaviour will be used to set default values on Commitment instances. Navigate to tab “Entity Behaviours“, and define an “Action” behaviour to be executed when attribute _resource is changed. This behaviour will be used to retrieve from LastFM API a unique album identifier.